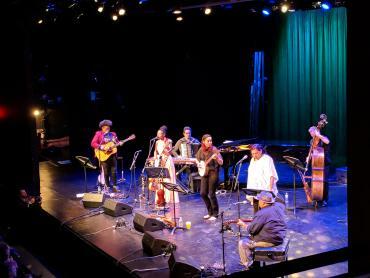 As the audience members headed out into Saturday night after the last drumbeats of “Freedom Highway” had sounded and “Sisters Present,” the final night of Rhiannon Giddens’ residency at Symphony Space on the Upper West Side of Manhattan, came to a close, you could see it in the wide smiles on their faces and hear it in their voices. They were taking with them the warmth and joy of an evening where the power of music and the spirit of togetherness gave off a light so bright and true it is hard to find the words to describe it. But, hey, let’s give it a shot. The show–part reflection, part celebration–was two sets of highlight after highlight, with Giddens leading a stage full of immense talent. To her right were two of her collaborators on the forthcoming Songs of Our Native Daughters album (due out in February on Smithsonian Folkways, according to Giddens), Amythyst Kiah (who kicked off the residency with her own showcase the week prior) and Birds of Chicago’s Allison Russell. To Giddens’ left were her sister, Lalenja Harrington, and Toshi Reagon, certainly no stranger to lighting up audiences in the NYC area (and beyond). All were ably abetted by the rhythm section of Jason Sypher on bass and Attis Clopton on drums, with Francesco Turrisi on accordion and piano. Giddens said they all had only started practicing together at 11 that morning, but the night flowed as if they’d been doing this for months. If there were any hiccups, the sheer joy that rose from the stage out to the seats surely covered them up. Whether it was Reagon guiding the crowd through the chorus of her “There and Back Again,” Kiah weaving the story of “John Henry”‘s Polly Ann from the Songs of Our Native Daughters project, Harrington captivating the assembled with her intense spoken word offerings, or Russell alternately gliding and stomping through “Sans Souci,” the audience was fully invested. Each performance brought its own kind of beauty and magic, and those on stage seemed just as into the performances as the crowd was, with Russell raising her arms in praise as others sang and Kiah mentioning after one song that she had to fight the urge to applaud after every number. Giddens, though center stage, was not clamoring for the spotlight, more than content to stand back and revel in the collective she had assembled. But, as always, her voice floated and soared when she took the mic, with a mix of honey and fire that gave vivid life to the words it sang, especially on “At the Purchaser’s Option” and a new, haunting piece about a child watching as her mother is hanged. Giddens has consistently made it her mission to bring forth such tales that too often remain hidden or ignored. And it is her genuineness and fervor that make the songs potent rather than precious, and lead to remarkable evenings like the one the sold-out audience experienced Saturday night. Going back out into the autumn air, the words that truly came to mind to describe the show were the hyperbolic ones that come screaming across ads for blockbuster movies or the Broadway smashes that play 50 blocks down the road. “Jaw-dropping!” “Breathtaking!” “Chill-inducing!” They’re words so over the top you roll your eyes and think they can’t possibly be true. And most of the time, they aren’t. But sometimes they’re the only ones that will do.